IMCDb.org: 1937 Ford V8 Standard Limousine 3.6 litre in "Schwarzwaldmädel, 1950"
I think it's a Ford-Köln V8. Is this a V8 Pilot by another name? No, this is pre-WW2. It is similar, though not identical, to the V8s Dagenham was producing at the same time. 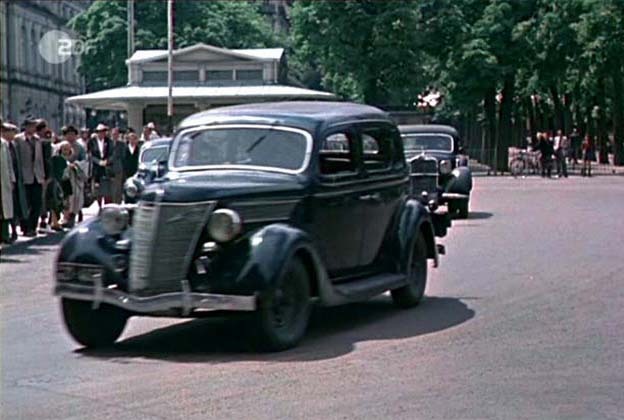 It is a German Ford Köln 1937 Ford V8 Standard 3.6 litre .These German Fords of 1937 still used the 1935/1936 body dies of the US model 48 and 68 of 1935/6 but had the 1937 style hood of the American model 78. It is a rare model nowadays since most did not survive the war.It was pelaced by another specific German model , the V8 Spezial in 1938.